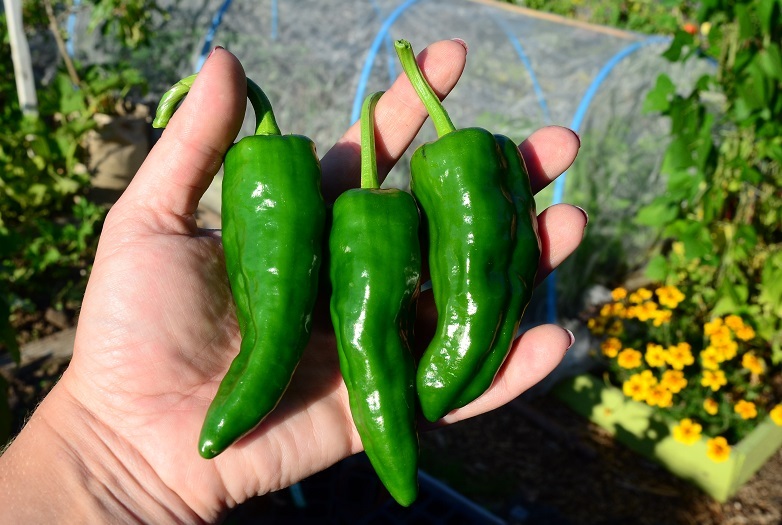 Gluts haven’t quite arrived, bar a sudden surfeit of padron peppers, but I can see them a-coming on the horizon! Just need a bit more sun to start turning more tomatoes from green to shades of ripeness. 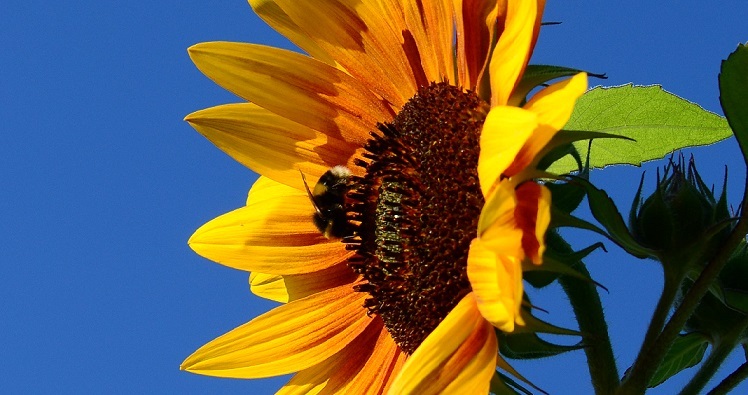 Thanks to my stalwart waterers everything’s survived our absence and I even came back to my first ever sky-scraping sunflowers- taller than the runners and currently each with at least one resident bumblebee pootling about noisily in the pollen. My whole plot is humming. I have cerinthe, marigolds, sweet peas, cornflowers, cosmos, nasturtiums and borage all flowering away madly – the borage and marigolds in particular have a bit of an insect haze hovering above them. 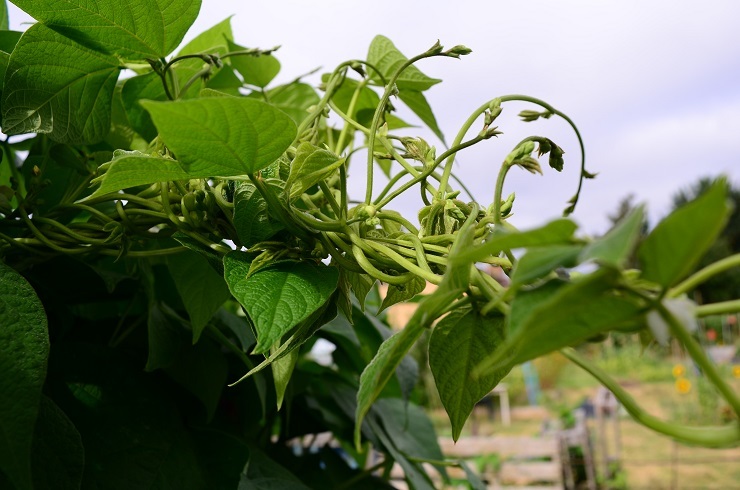 The surviving climbing beans have turned into a massive clump of green – it’s almost as if they are trying to make up for the ones that were munched. The munty frame is groaning under the weight of vines, and I am a bit concerned that poly twine might snap. Some of the vines are obviously bored at the thought of growing straight and went off for a self-plaiting party while we were away. Unravelling this was beyond my (admittedly low) patience levels. I got halfway through, discovered they’d nearly all retwisted and chucked it over the bar in the general area of the strings. They can sort themselves out! The one bean arch is similarly loaded and sways ominously in the wind. I have some 3ft stakes lying around, and they are going in today to brace it a bit. One side has about 12 Cherokee Trail of Tears plants, the other 4 Monachelle di Trevio and it’s difficult to see which side will give me more beans. It looks fantastic too: the other arches are mournfully empty in comparison. Plus it provides lovely shade for the rarely spotted Him Indoors to have his lunch (he may later have been caught sunbathing in just his undercrackers, but that’s a whole other story!). I think I’ve learned my lesson – squashes and cucumbers just don’t grow very high for me…not when the slug overlords use the wires as a climbing frame! Next year they will be all loaded with beans. 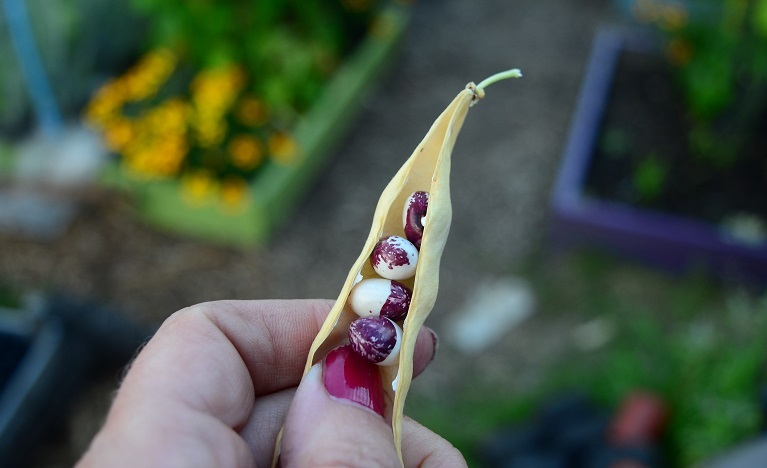 Some of the beans are ripening very early. I’m not sure whether it’s down to the stress of being continually attacked by slimies, or whether it’s an early warning about winter. In any case, I have a growing collection of very pretty Inca pea beans for next year. Frustratingly there aren’t enough for me to offer into seed circles – but perhaps next year will be better. One experiment that is working really well is peat vs peat-free. I have 6 padron pepper plants, 3 in pots of peat-based compost on #92 and 3 in Sylvagrow peat-free compost on #100. The peat pots have been fed with Growmore, the peat-free with blood, fish and bone. I’m not comparing overall yields between the two as the peat-free seedlings are about a month younger, but the difference in the size of the peppers is pretty amazing. The pots on #92 are chucking out good quantities of 5-6 cm peppers. The peppers from #100 are ENORMOUS. The plants are bigger, and I am (hopefully) saving seed from these for next year as my Seeds of Italy packet is getting a little elderly – germination rates were noticeably down this year. So my verdict from this limited trial is – peat-free compost gives you plants that perform at least as well, if not better, than peat-based compost. Now to encourage my local garden centre to stock SylvaGrow….! I use a lot of coir, mixed with peat free mpc and perlite, as a potting medium and have found that as long as plants are well fed they leap ahead. Stick with peat free where you can is what I say! Love the look of those Padrons!! Thanks Kathy – I am thinking about going totally peat-free if I can get enough materials together to make some of my own compost too. The padrons are delicious, though they are starting to get hotter and hotter!